Mint creates a fresh blue-green dye color with alum salts and an iron modifier, and it smells wonderful while steeping in the dye bath. In this project, raw silk and fresh mint dyed using the itajime shibori technique create a table runner and matching dip-dyed napkins, a perfect base for a spring dinner party—or any occasion. The wonderful thing about natural dyes is that the source of the color can be truly surprising. For instance, one would think that pomegranate seeds hold a treasure trove of dye color, but it is actually the pomegranate rind that holds the true color potential and has been used for millennia as a dye. Pomegranate rinds can provide red, golden, ochre, or even black tones depending on your dye formula. The project here opted for gold for celebratory glam. 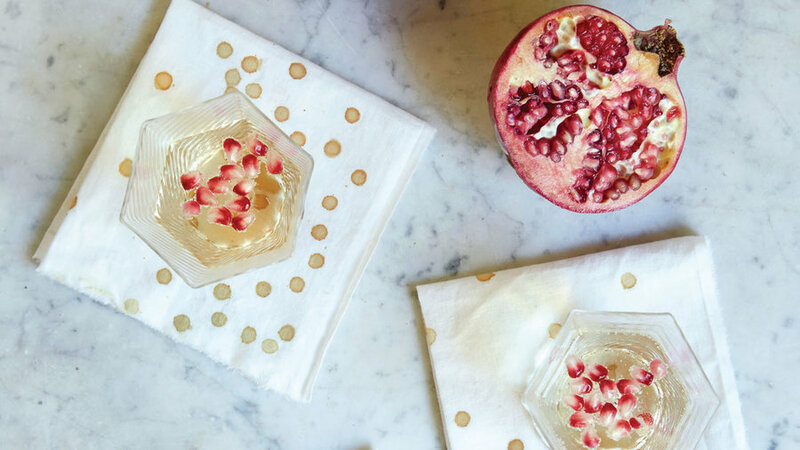 By using fresh pomegranates, you can enjoy a holiday pomegranate cocktail with the seeds and then use the rinds to dye the confetti-print cocktail napkins. As an evergreen, popular for holiday decor, blue spruce is an excellent source for a winter dye. 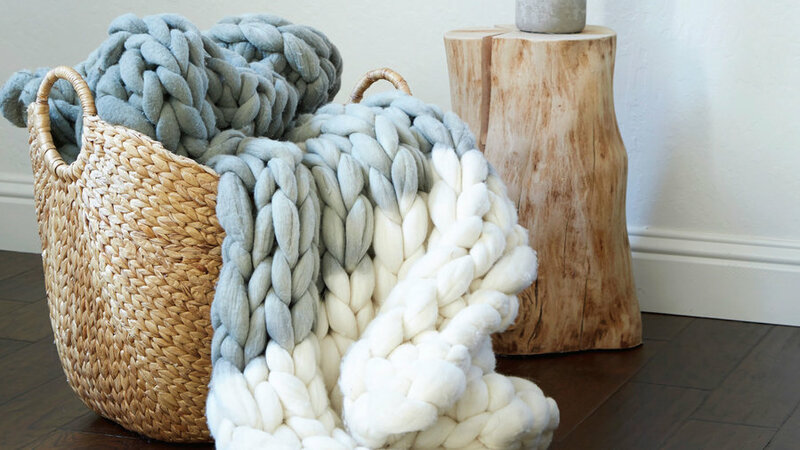 The color produced by blue spruce is especially stunning on wool, and winter is a good time to dip-dye an extra-thick knitted woolen winter blanket to bring the essence of outdoor evergreens into your home. This ombré dyeing project is a great way to spruce up your home by reusing your holiday tree and winter celebration decor. When you drain your dried black beans after soaking them overnight for cooking, you can use this rich and dark natural dye to color some beautiful local wool. The water left after soaking dried black beans is a fantastic natural colorant, creating hues that range from dark blues and teals to steel grays, pinks, and purple. 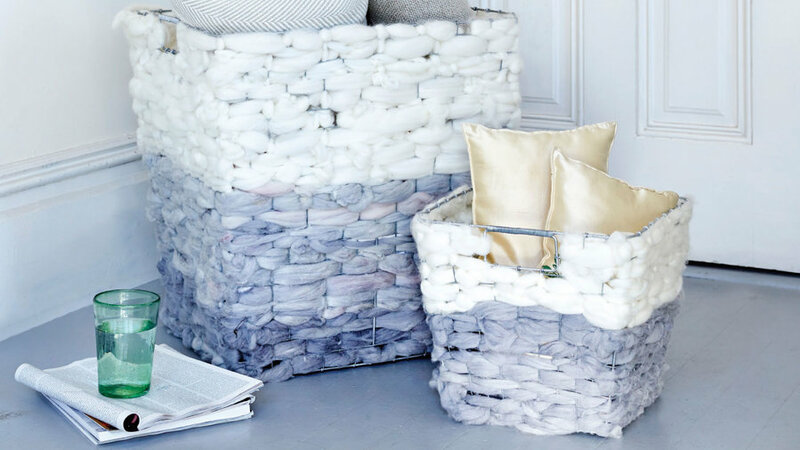 For this project, weave dyed wool roving through wire mesh baskets—making for both an easy weaving project and beautiful storage baskets for all your plant-dyed textiles. 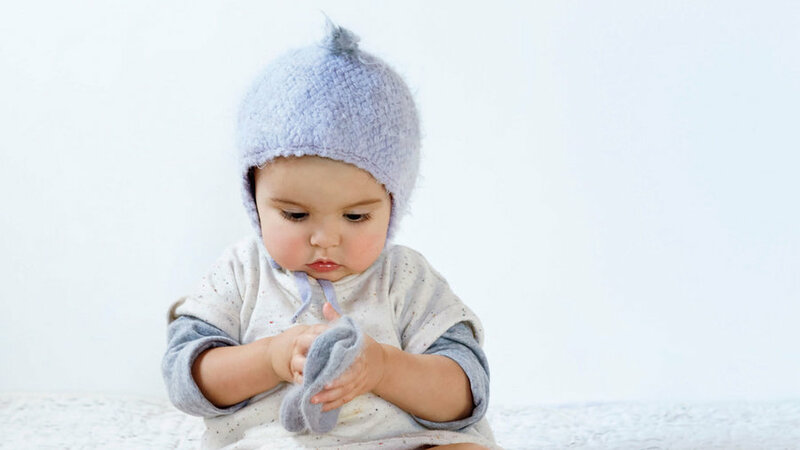 Red and purple winter cabbages make beautiful pastel lavenders, blues, and light greens on soft merino and angora wools—a wonderful way to naturally color a baby’s winter hat and mittens. With this project, you not only work with heirloom knits, but also refresh your little one’s garments with natural color recipes from an heirloom plant that can be passed on from generation to generation. Also, because the cabbage color can be so easily modified, it can be a wonderful way to simply change the color or pattern of your hat and mittens from baby to baby, adding a new layer of creativity and special hue for each new addition to the family. All parts of the eucalyptus tree can be used to make lightfast and washfast dyes that work well on all fibers. Potential colors range from yellow and orange through green, tan, chocolate, and deep rusty red, but the tree’s abundant and beautiful bark provides an easy, no-fail, nontoxic way of creating natural blacks. 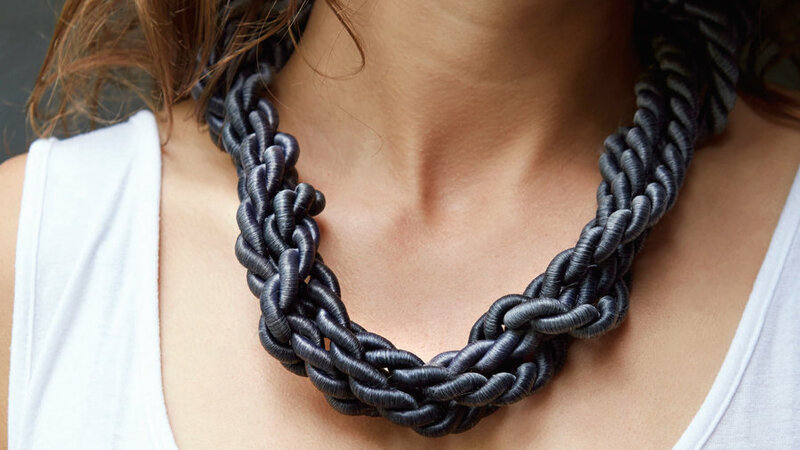 This recipe is for blacks and silvery dark grays on rayon rope to make a twisted fabric necklace. Madder is unsurpassed for its glowing, earthy warm hues and potential to make rich, clear plant-based reds otherwise difficult to find in nature. You can continue to use one madder root bath to get lighter shades of red, coral, and pink. 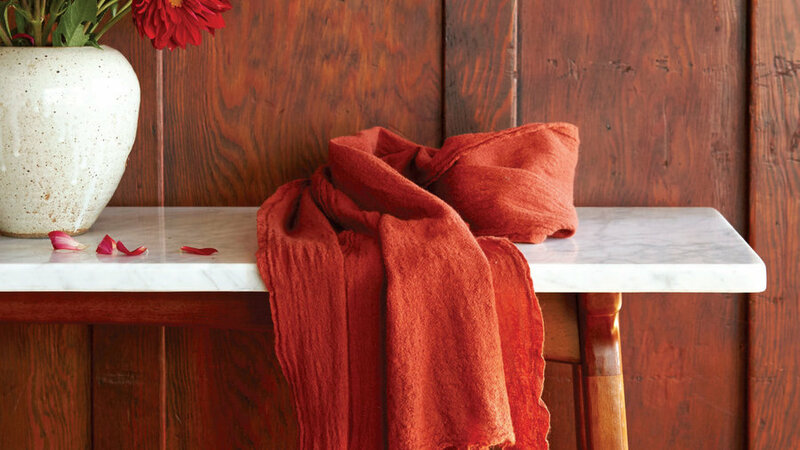 Dyeing with madder root is satisfying any time of year, but its vital oranges and deep reds are especially suited for fall. As with this scarf project, madder yields the perfect shades to dye any thick woolens in your closet to warm the darker, cooler days. Onion skins are one of the most wondrous “compost” colors. Their beauty lies in how easily accessible they are and how often they are overlooked as waste in grocery stores, restaurants, and even your own kitchen. The skins, both yellow and red, contain the potential of deep saturated oranges, golds, ochre, and dark green. 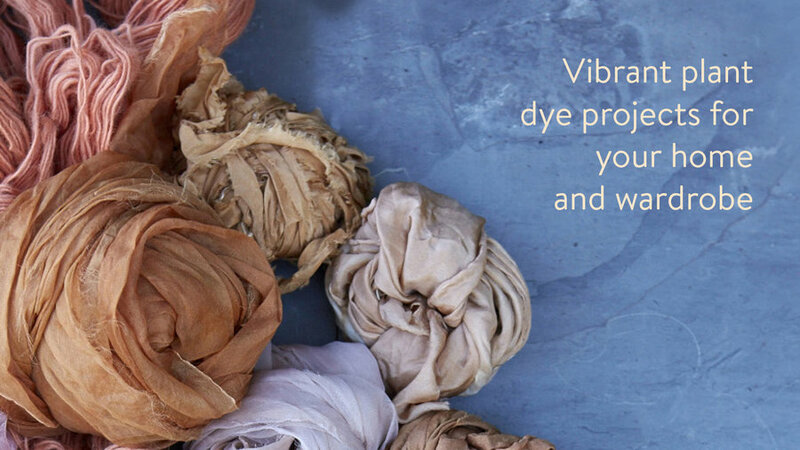 With a concentrated dye bath and enough time for the fibers to steep in the dye, these earthy hues truly glow. 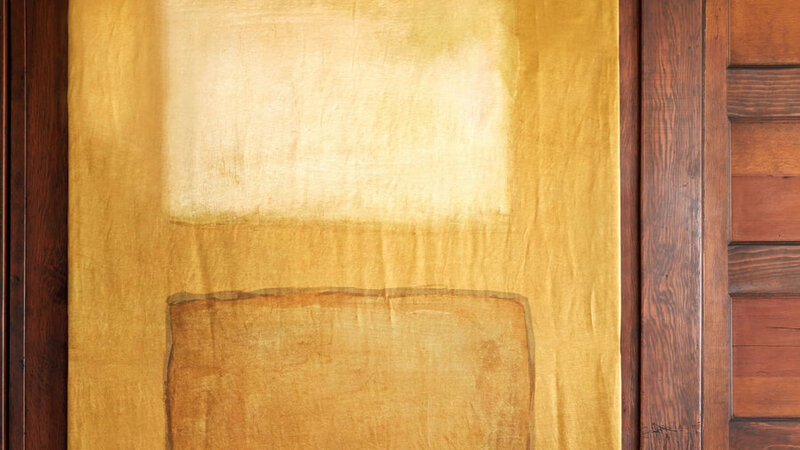 This project is a combination of dyeing and painting with mordant and modifying guar gum pastes to create extrasaturated and layered painterly color effects—creating a natural onion skin-dyed Rothko-inspired painting. The complete Natural Color book by Sasha Duerr has loads more projects for you to try.